Appearance: While Leth rules the sky, Pease is his Ethaefal self. Standing tall, 6’3”, graceful limbed and with a vibrancy that sways with the season, Pease is a silent but deep reminder of a wider world; the Ukalas. 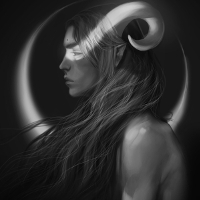 His glorious horns, the perfect curve and his favourite, rest in a thick mane of often-tangled and long hair. His almost hewed features yield, only after investigation, a wild demeanour that often unmasks his inner emotions. During the daylight bells, Pease is his Chaktawe self; a dark contrast to his opalescent form. Where once his eyes were bright as quicksilver, pure unadulterated black prevails. His pale skin darkens to a dusky Syan kissed tan with a ruddy hue. He stands 5’9” with shoulder length black hair. ** Don't forget you get a FREE HEIRLOOM worth 50 GM or less. This can be anything you'd like so long as it is not a magic item. Pets are also acceptable.